Researchers at Oxford University and The Sainsbury Laboratory (Norwich, UK) looked in unprecedented detail at how Phytophthora infestans, a pathogen that continues to blight potatoes and tomatoes today, evolved to target other plants. The study, published today in the journal Science, is the first to show how pathogens switch from targeting one species to another through changes at the molecular level. 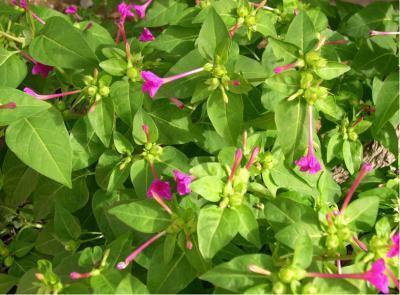 Researchers examined the biochemical differences between Phytophthora infestans and sister species Phytophthora mirabilis, a pathogen that split from P. infestans around 1300 years ago to target the Mirabilis jalapa plant, commonly known as the four o'clock flower. They found that each pathogen species secretes specialized substances to shut down the defences of their target hosts. Mirabilis jalapa (the four o'clock flower). This plant is the host of Phytophthora mirabilis, the sister species of the Irish potato famine pathogen Phytophthora infestans. 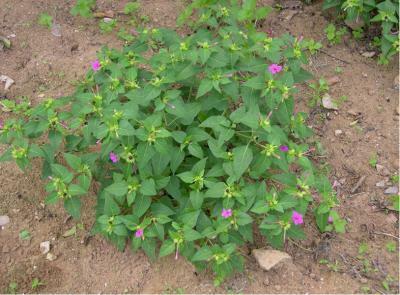 This is Mirabilis jalapa (the four o'clock flower). This plant is the host of Phytophthora mirabilis, the sister species of the Irish potato famine pathogen Phytophthora infestans.